Here's the antithesis to all that "Monaco" stuff we featured last week - two new editions of the Jaquet Droz Grande Seconde Quantième. I've said it before, and I'll say it again, each Jaquet Droz watch is an artform and each Jaquet Droz watch is exquisite - no exceptions. The Grande Seconde dial is instantly recognisable and if you've ever seen one in the metal, unforgettable - two gently over-lapping dials form the fortuitous number 8, surrounded by empty dial space, all framed by a trim bezel. It's pure, it's unique and it's gorgeous. In 2011 the brand introduced to the collection for the first time a steel watchcase, available in either all-black or pearly-white dial editions. Now it's back with two new Geneva-striped dial models, each of which have the charm, texture and sheen of fine, pleated silk. 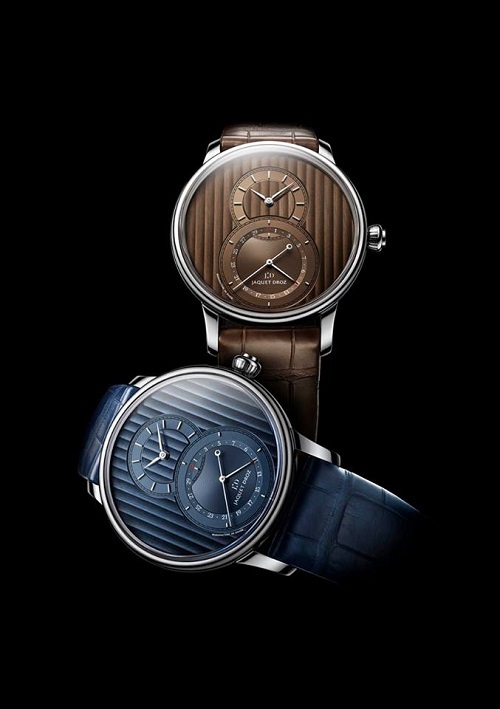 The brown dial is rich and mellow, the blue dial is luscious and tempting. Both are resplendent. A dial of such perfection must not be trifled with, and the designers at Jaquet Droz must content themselves with only subtle tweaks. For these models batons replace numerals for the hours, minutes and seconds leaving only the pointer date to be represented by numbers. Previous models indicated time using Roman Numerals which bring to any dial a little pomp and ceremony, and their absence for these models along with the new colours adds modernity to this very traditional dial layout. Inside each 43mm case is the Jaquet Droz in-house 266OQ2 calibre and each of these most agreeable new Jaquet Droz Grande Seconde Quantième models will be presented on a dial-matching alligator leather strap. The 2011 Jaquet Droz Grande Seconde Quantième "All-Black or Pearly-White" here.